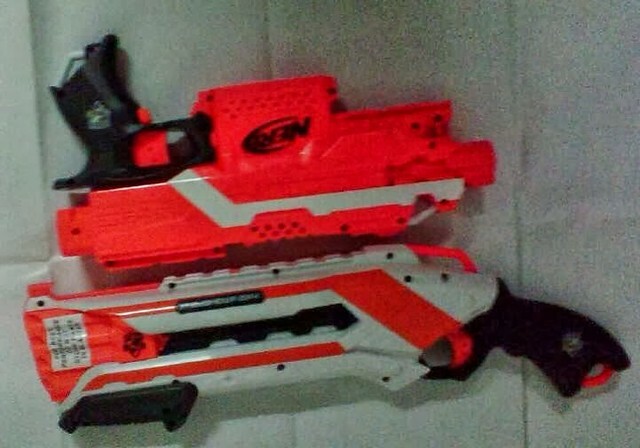 The newly spotted “Red” Stryfe, alongside the other recently leaked White Rough Cut. 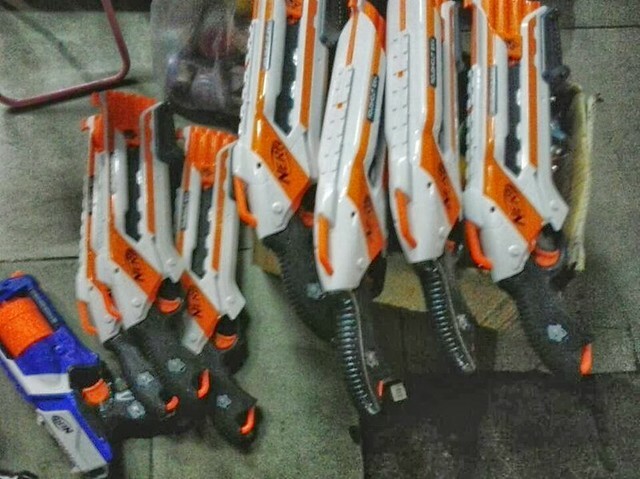 Recently, a possible new Red Stryfe has been spotted on Baidu. The quality of the photo isn’t the best though, and many are questioning the possible color of this leaked photo. The photo seems to give off a Red/Pink color scheme, but again the photo is on the grainy side. I’m personally thinking that the Stryfe could be an orange color, and that the concentrated amount of it, as well as the low light, is giving the camera a deceiving look. The orange on the White Elite Rough Cut is looking like Red/Pink as well in some areas. This is the main reason as to why I think this newly seen Stryfe is an Orange color. In isolated, rotated look at the Red/Orange Stryfe. It also seems like we’ve gotten a bit of official confirmation from Hasbro Australia that the White Rough Cut will be a Target exclusive in Australia. It will “most likely” be a Target USA Exclusive as well. Information and photos thanks to Southern Brisbane Nerf Club. I’ll be sure to keep you updated as more news of these blasters hit the net. The Stryfe is orange: in the picture that has a Strongarm, the stripes on the Roughcuts are orange and assuming that there’s no difference between the Roughcuts in that picture as the pic that has both a Roughcut and a Stryfe (the Stryfe is the same colour as the Roughcut’s stripe) it confirms that the “red/orange” Stryfe is indeed orange. And since when does Nerf make red barrels?! 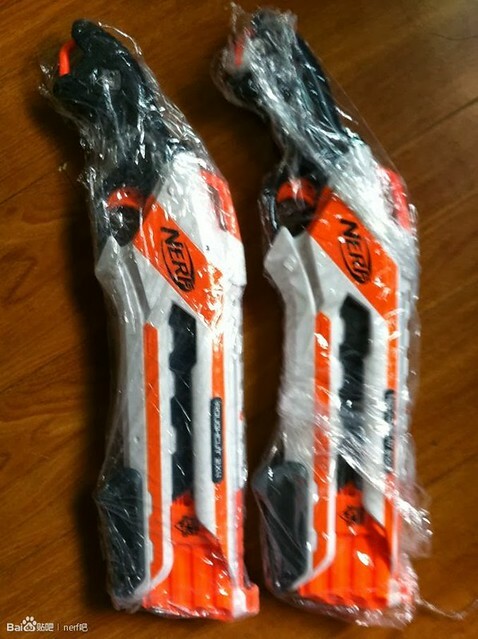 I agree…the Stryfe must be orange, as some laws require barrels of toy guns to be orange. And if the barrel is orange, we can assume the rest of the blaster is orange too. Is it just me or is the Stongarm in the picture with the Whiteout Rough Cuts has a darker handle? You’re completely right! Even I did not notice that the Strongarm had a darker handle until you spoke up. However, the rest of the Strongarm looks the same. 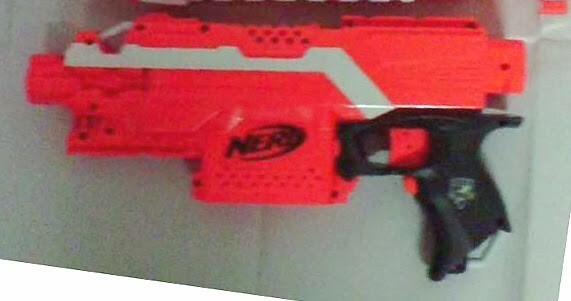 An update on the darker-handled Strongarm that Nerffan pointed out: It’s true, and the Target in my area is carrying them! It’s not only the handle that changed. The silver stripe beside/behind the nameplate is missing, as well as the three silver stripes above the turret release switch. Additionally, the NSE logo on the other side of the gun is not painted in. I could not provide a picture as I did not have a smartphone/camera with me. Unsure of any internal changes, as I have a white-handled Strongarm already and did not pick a “new” one up. My speculation is that Hasbro has to save money somehow, and one way is to reduce detailing on some blasters such as the Strongarm.